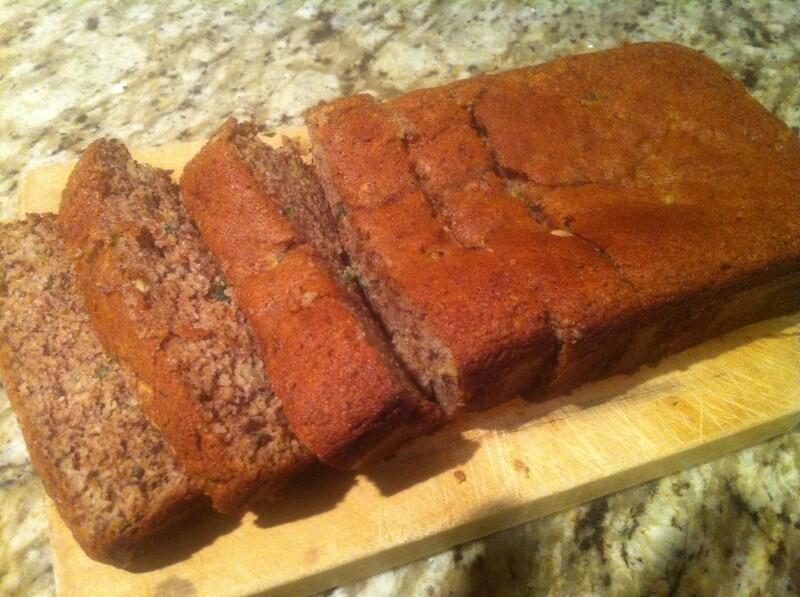 Since I couldn’t have a conventional birthday cake this year, my mom made me this Paleo Zucchini Bread — so I’m giving her the recipe credit. It was super moist and delicious! Such a great treat after having to give up bread and sweets. Step 1 Preheat oven to 350 degrees and grease one large loaf pan. Step 2 Combine the almond flour, baking soda, salt and cinnamon in a bowl. Step 3 Using a mixer, whisk in a separate bowl: eggs, honey, banana and coconut oil until smooth. Step 4 By hand, mix in zucchini with wet ingredients. Step 5 Slowly add the dry ingredients to the wet ingredient, mixing until well incorporated. Step 6 Pour batter into loaf pan and bake for 25-30 minutes or until you can insert a toothpick into the middle of bread and it comes out clean. Step 7 Once cooked, remove from oven and allow to cool.